Vanilla Coconut? Why not just call it heaven? 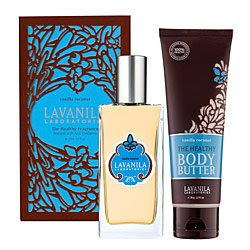 Because that's exactly what the LAVANILA Vanilla Coconut Set is ... a little piece of heaven. This duo comes with an eau de parfum spray and body butter that leave you feeling and smelling completely amazing. The scent is just heady enough to resonate on your skin, but not so heavy or cloying that you'll be dying to wash it off mid-morning. Truth be told, I've gotten compliments each time I've slathered myself with the lotion! My roommate alone has probably complimented me 10 times in the last 10 days. Add to that the fact that it's not greasy and sinks into skin relatively quickly and it's a total godsend. The fragrance is infused with notes of coconut and Madagascar vanilla bean, along with monoi tiare, which really lends it a delightfully sensuous island vibe. And since it's formulated with pure essential oils and active botanicals, it's good for your skin, too! Antioxidants like goji berry and kakadu plum meld with willowherb and olive leaf in addition to 30 vitamins and minerals and 19 amino acids. Can you believe all that goodness is packed into one little bottle?